The Asian Patent Lawyer’s Annual 2018 – OUT NOW. Page 9 – How to best protect your intellectual property rights in the Russia-Eurasian region by Mr. Erik Goussev, Patent Attorney, Papula-Nevinpat. Page 13 – Submission of information: Disclosure documents at the Indian Patent Office by Dr. Mohan Dewan from R K Dewan. Page 17 – Status of patent application pendency in Vietnam by Pham Vu Khanh Toan, Managing Partner at Pham & Associates. Page 21 – “Obviousness – A vague phantom” by Pravin Anand, Managing Partner of Anand and Anand. Page 25 – Case study: Requirement for patent confidentiality examination (foreign filing license) in China by Mr. Binglin Li from Chofn Intellectual Property. Page 29 – Is it possible to obtain effective protection in Europe after EPO refusal? by Lech Bury, Bury & Bury. 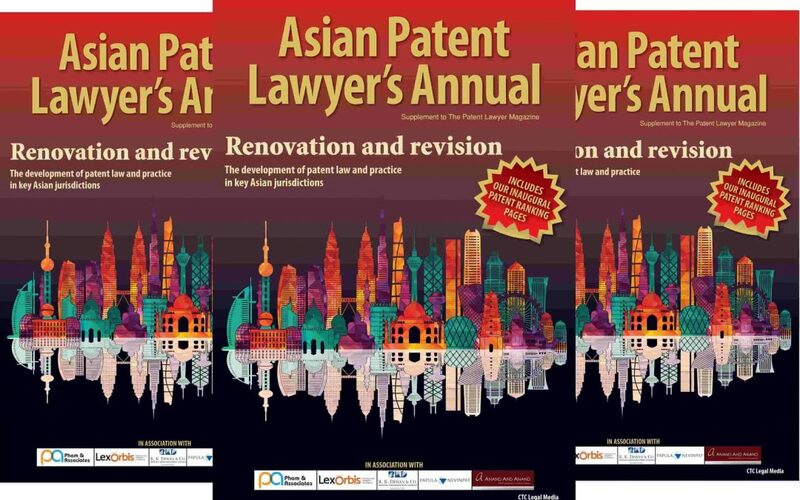 Every year, we publish this magazine dedicated to patent law in the Asian region and, every year, thousands of you read the informative articles about the progress of Asian patent law. This year is no different: we have gathered articles from patent professionals around the world focusing solely on Asia to give you focused and relevant information to suit your requirements. This issue, for 2018, includes out inaugural Asia Pacific Patent Rankings on page 44. We’ve gathered a list of Asian patent law firms by carrying out extensive research over the past few months and included the final findings in this magazine. We would like to take this moment to thank everyone who was involved with and helped us with the research – we look forward to working with you again in the future for other regional rankings. Arguably, the reason this magazine is so popular is down to the substantial progress the Asian intellectual property industry accomplishes every year; here are a few examples of that progress throughout 2017. In February, amendments were made to Indonesian patent law (Law No. 13 of 2016), which included online filing, extension of scope of simple patents, stronger protection of genetic resources, and changes to protection of pharmaceuticals. In March, Japan granted its first two trademarks for colors only and May saw Korea update its law on extension of citation data in KIPRIS to include ‘backwards citations’. Following on from this, in August 2017 it was announced that Thailand joined the Madrid Protocol for the International Registration of Marks, thus allowing applicants to apply for a trademark in several countries by filing a single international application at a national/ regional IP office of a country/region that is party to the system. Finally, October saw the introduction of the PPH pilot launched between the EAPO and the EPO. All of this and so much more contributed to the growth and importance of the intellectual property industry in Asia and contributes to the reasons why this magazine is so successful and relevant, every year. With China and Japan consistently remaining in the top five patent filing countries, with filing numbers increasing year-in-year-out, Asia is definitely a continent to be considered and not underestimated. We’ve covered a range of topics that outline the adaptations of law, key trends in the region, and the progress Asia has made over the past year. There is, as always, something for everyone in this issue and we are excited for you to read it. Without further ado, here is the 2018 Asian Patent Lawyer’s Annual!